Two major anti-Iran groups in DC are more than they appear. My colleague Eli Clifton has a new piece up at Salon about the pro-sanctions group United Against a Nuclear Iran (UANI) and its somewhat murky links to a billionaire precious-metals investor named Thomas Kaplan. I suggest everyone check it out: it’s a fascinating tale of colliding interests; namely, that the head of UANI also helms ventures with the billionaire that stand to, by its own account, make a lot of money in the case of instability in the Middle East—up to and including “confrontation” with Iran. Eli mentions in the course of his reporting a recent New York Times article that describes an intervention by the Justice Department to protect information held by UANI from being disclosed in court. There’re a lot of granular details about the case—a defamation suit by Victor Restis, a Greek shipping magnate whose company UANI accused of being “frontmen for the illicit activities of the Iranian regime”—but for our purposes here the important parts revolve around UANI’s ties to Israel. The suit alleges that UANI dispatched an Israeli businessman (otherwise unconnected to UANI) in order to broker a resolution to the dispute over the alleged defamation, and raises suspicions that Meir Dagan, a former Israeli spy chief and UANI advisory board member, provided information to the group about Restis’s company. Now, UANI has former officials from a host of countries on its advisory board, but an observer would need to be willfully blind to miss the consistent pattern among pro-sanctions hardliners in Washington: most, if not all, align with DC’s right-leaning pro-Israel camp. Indeed, one need only listen to members of Congress raise Israel’s security as they vie to take the toughest positions on sanctions. Despite its diversity, UANI delivers on this front, with staunch Israel supporters, such as Joseph Lieberman, on its board, and with its staff drawn from and moving among pro-Israel activist and media circles. 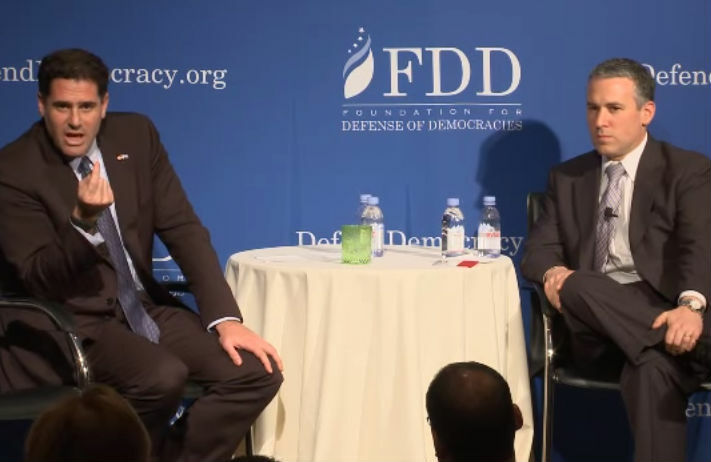 One of the most active and most hardline groups on Iran, of course, is the Foundation for Defense of Democracies (FDD), whose influence Eli and I discussed at length in our recent Nation feature. (UANI and FDD officials have appeared together at events sponsored by dedicated pro-Israel groups.) The neoconservative think tank is certainly no exception to the pro-Israel bent of Iran hawks in DC. But even the extent to which the group serves as a pro-Israel outfit has been obscured in the course of its thirteen-year history. FDD’s origin myth is, in fact, just that: a myth. Today the group’s website proclaims, “FDD was founded shortly after 9/11 by a group of visionary philanthropists and policymakers who understood the threat facing America, Israel and the West.” But according to its application for tax-exempt nonprofit status, FDD was “incorporated or formed” on April 24, 2001—five months before the September 11 attacks. As a result of the terrorist attacks on Tuesday, September 11, 2001, the Board of Directors determined that EMET’s mission should be expanded. The Board has recognized the sad fact that Israel is no longer the only democracy in the world facing the scourge of terrorism. The application goes on to list things the FDD board “believes.” Among the five bullet points are two focused exclusively on Israel. One states, “The way to achieve peace in the Middle East is not by compromising Israel’s existence as the only democracy in the region, but rather by defeating terrorism.” Defending Israel, in other words, remained central to FDD’s work, despite the expanding mission. Indeed, FDD has a disproportionate focus on Iran—of twenty-one officials and experts listed on its website, more than half are described as Iran specialists of one sort or another—which, as I’ve said before, is an Israel issue in Washington. And looking at other groups working intently on Iran, as described by Eli and myself in our feature, one needs not look very hard to find the Israel angle: one of the groups we spent a great deal of time on was the American Israeli Public Affairs Committee, America’s pre-eminent pro-Israel organization. This is not to say all pro-Israel groups oppose diplomacy with Iran, of course: two of Washington’s most astute pro-diplomacy groups, Americans for Peace Now and J Street, hail from the liberal pro-Israel camp. But the center of gravity of Israel advocacy trends right, and many of these groups and their staffs have staked out aggressive pro-sanctions or outright hawkish pro-war positions. Pro-Israel advocates recoil at the notion that they played a major role in the build-up to the Iraq war. But if diplomacy with Iran fails due to measures pushed by these groups, a confrontation over its nuclear program becomes all the more likely. With all their activism against negotiations and compromise, it won’t be difficult to draw a line from pro-Israel groups like FDD and deeply Israel-linked groups like UANI to the potential conflict.